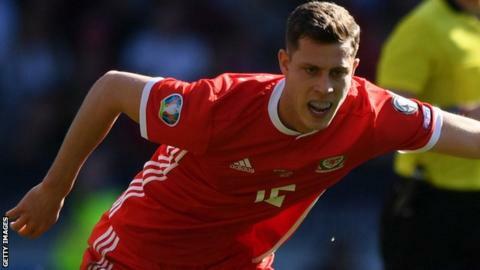 Wales defender James Lawrence has said it would be a "dream" to play in the Premier League one day. The 26-year-old was a youngster at Arsenal and QPR before moving to the Netherlands and latterly Slovakia with AS Trencin, switching to current club Anderlecht in August 2018. "The Premier League would always be tempting for me," he said. "Having been away from England for so long that's always been my dream, to make it back there. "But for now I'm happy where I am and we'll see where it takes us." Lawrence was a surprise call-up by Wales manager Ryan Giggs for last November's games against against Denmark and Albania. The Henley-born player, who qualifies for Wales through his Haverfordwest-born grandmother, won his third cap against Slovakia. "I was already happy with the two caps that I had and now to get the first start is amazing," Lawrence added. "Two days before the game we went over the team and went over some set pieces. "So I did have some time to get my mind around it and settle myself down ready for it." Lawrence was given the nod ahead of Ashley Williams for the opening Euro 2020 qualifier after the captain was dropped from the starting XI. "I've got massive respect for Ash and everything that he has done. He's a massive influence on me," Lawrence said. "The gaffer has got to make decisions and he obviously chose me and I was very happy about. "But take nothing away from Ashley, he's been great for Wales."